Wolves, elegant and fierce, advanced to the FA Cup semi-finals for the first time in 21 years. Manchester United could do nothing about it. First Ole Gunnar Solskjaer's men were frustrated by their hosts, then they were taken apart. Goals by Raúl Jiménez and Diogo Jota confirmed the superiority of Nuno Espírito Santo's team. Marcus Rashford's goal in stoppage time changed nothing. A cold wind blew and rain drenched the pitch before kick-off but the football forecast was bright: this was the weekend's highest-pedigree quarter-final if judged by league positions and the team sheets proved each club's determination to advance. Other than sticking with their policies of fielding their reserve goalkeepers for this cup, both managers selected their strongest available sides. It had been suggested Solskjaer might wait until after the international break to reintroduce Jesse Lingard, Anthony Martial and Ander Herrera to the starting line-up after recent in juries; instead the manager cast them straight back into action here. No one could say United were saving themselves for the battle to finish in the Premier League's top four and the imminent Champions League joust with Barcelona. Nor was there anything to indicate United's confidence had been dented by last week's reverse at Arsenal, their first domestic defeat under Solskjaer. They made a vibrant start, popping the ball about with adventurous intent. But Wolves are savvy operators under Nuno and, though deprived of the ball for most of the opening quarter, they kept the visitors out of range. United had most of the ball but could not be described as dominant. There was a sense that Wolves were keeping their visitors at bay with a degree of comfort while remaining primed to counter-attack when possible. That was until the 26th minute when United opened them up with a cute one-touch move around the box before Lingard fizzed a low cross into the danger zone. Martial would have had a chance to score from six yards if not for an excellent tackle by Leander Dendoncker. Wolves brushed off that scare and soon threatened at the other end, Sergio Romero having to make saves from Rúben Neves and Jota. Both teams had appeals for penalties turned down before the break and then Chris Smalling got himself in trouble in midfield and Neves pierced the remains of United defence with a surgical pass from deep. Jota, however, was less precise, curling his shot too close to the advancing Romero, who batted it away. United, for all their possession, had been so successfully nullified that they managed just a single shot on target in the first period, Rashford's harmless one from long range. Wolves went much closer in the 53rd minute, when Jiménez, as strong as he is lithe and canny, held off Victor Lindelöf to connect with a corner by João Moutinho. The striker's header from eight yards was en route to the net until Romero tipped it onto the crossbar. Wolves were not just keeping United at arm's length, they were seizing the upper hand. In midfield, Moutinho, Neves and Dendoncker started to flit between Nemanja Matic, Paul Pogba and Herrera like artful dodgers confronted by dull bouncers. Solskjaer needed to make a change. But like his players, he did not act fast enough. In the 70th minute Moutinho wriggled his way into the box and slipped a low pass through to Jiménez, who held off Lindelöf and Pogba before turning and firing low past Romero. 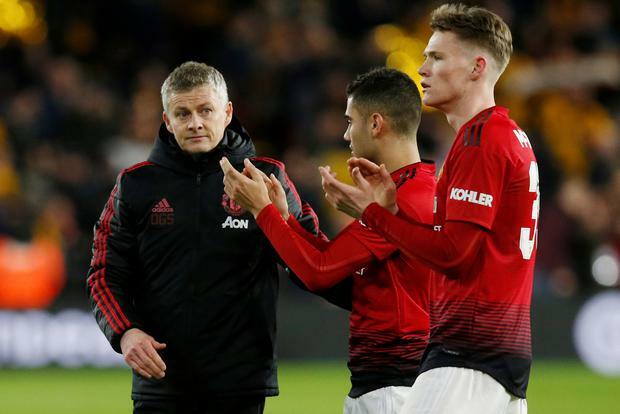 Solskjaer replaced Herrera with Andreas Pereira. But Wolves scented blood and soon finished off their visitors. The killer blow came six minutes after the first. After clearing a corner Wolves overwhelmed United with a counter-attack, Jota concluding it by outfighting and outwitting Luke Shaw before thrashing a shot into the goal. United's woes appeared to grow when Lindelöf was dismissed for sliding through Jota to win the ball, but the referee downgraded the red card to a yellow after consultation with VAR. That was the only reprieve United got despite Rashford's late strike.